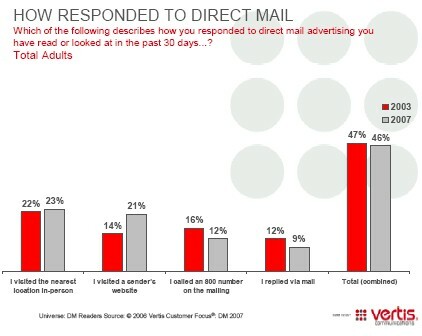 85% of women ages 25-44 read printed direct mail marketing pieces, while some 53% of all women surveyed who have access to e-mail, read e-mail advertisements, according to Customer Focus Direct Mail study by Vertis Communications. 72% of total adults surveyed said they have replied to direct mail containing a “buy one, get one free” offer. 63% of all adults indicated they have responded to direct mail collateral offering a percentage discount on merchandise, up from 54% in 2005. Customer Focus is Vertis Communications’ proprietary annual study tracking consumer behavior across a wide variety of industry segments — financial, credit cards, insurance, publishing, casino gaming, retail, automotive — and media including advertising inserts, direct marketing, and the Internet. The survey of 2,500 adults — conducted via phone by one of the nation’s leading field research companies in August/September 2006 — measures both general and industry-specific shopping trends.